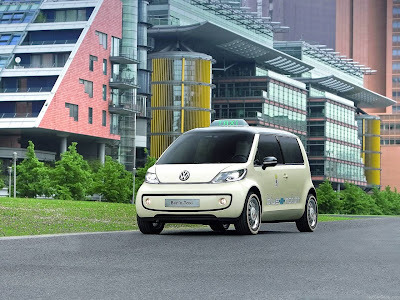 Volkswagen has announced that it will launch its first production electric vehicles in 2013. Electric cars that are driven with zero emissions will revolutionise mobility over the mid-term, especially in urban areas. 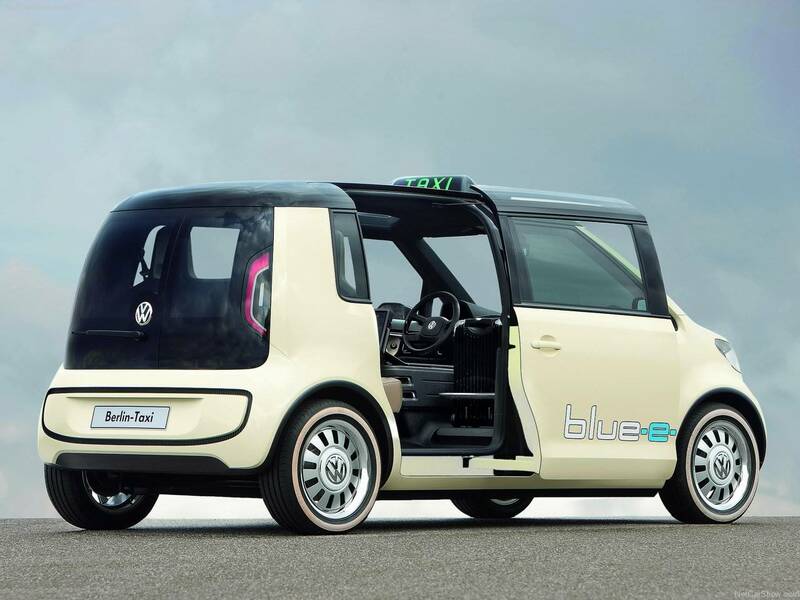 However, Volkswagen is not just thinking of individual mobility in the style of the future Golf blue-e-motion, but is also considering its possibilities as a vehicle in public transportation. That is why Volkswagen is now showing - in the context of the foundation event for a "National Platform for Electric Mobility" - just how a mass-produced taxi driven by an electric motor might look. 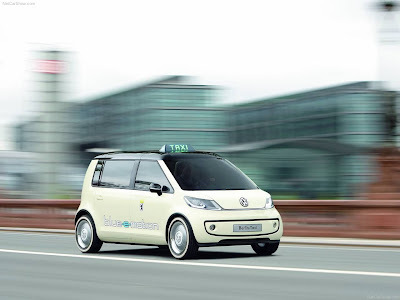 After the world premiere of the Milano Taxi of the same design, the Volkswagen Berlin Taxi Concept car was created as a second city van tailored to the needs of taxi drivers and their passengers. 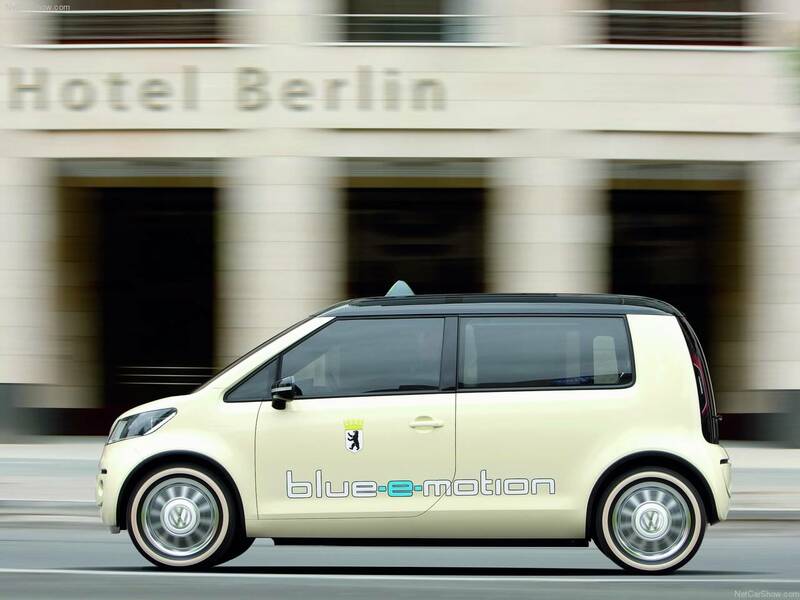 It features many innovative details such as a forward-opening sliding door and customisable taxi touchscreens. The Volkswagen Berlin Taxi is still a pure concept vehicle. Yet, with its styling that bears similarities to the legendary Volkswagen Samba bus, zero-emissions drive system and very tangible, practical benefits of a compact space wonder, it could very quickly become a highly coveted vehicle in cities like Berlin or Milan, New York, Beijing, Cape Town, London, Moscow or Tokyo. The exterior: The design team decided that "One door less offers even more in a taxi," and this had a crucial influence on the vehicle's technical and visual concept even before the first pen stroke was made. This is a good feature: The safest way for passengers to enter and exit a taxi in city traffic is on the sidewalk side. 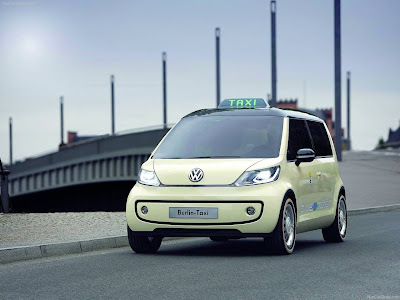 And that is why the development crew sent the Volkswagen Berlin Taxi on its way with just a single sliding door that opens far forward on the passenger's side. Thanks to the development of an entirely new mechanism with two-axis kinematics, this door opens wide to offer a broad entrance. The sliding door extends well into the roof, so it also offers an enormous opening in terms of height. 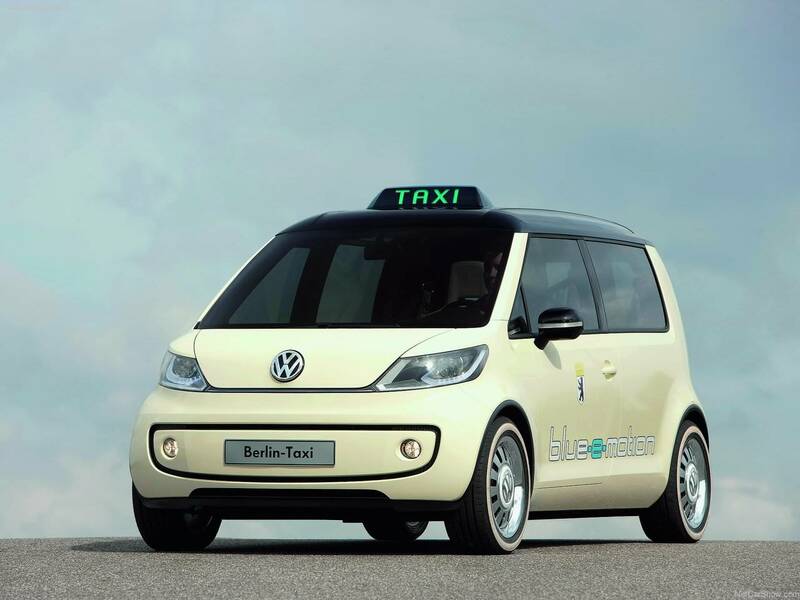 Apropos: The Volkswagen Berlin Taxi Concept is 1.60 metres tall, 3.73 metres long - or more accurately short, and 1.66 metres wide. Similar in style to the Volkswagen Samba Bus of the 1950s, the outer roof areas are designed to be transparent (as part of the doors in front and at the right rear). This unique design feature that is characteristic of the brand - together with a panoramic glass roof - creates a bright and friendly interior ambiance. In addition, passengers aboard the taxi will appreciate the new viewing perspective of the city's architecture. The concept car being presented in Berlin also opens a window to the future, since the VW Berlin Taxi reflects the genes of a future Volkswagen "design DNA". Consider the front end: It is no coincidence that it displays a prominent "face" - both friendly and confident - with stylistic hints of Volkswagen icons such as the Beetle and the Samba bus. These specific genes also include the front bonnet that is drawn down low as well as the "elimination" of the classic radiator grille. An entirely new element is the transparent crossbar that joins the two headlights. A prime example of the reversal of the "form follows function" design principle is the port for recharging the batteries: The connector is located beneath the VW logo that swivels upward on the "E-motor bonnet". Meanwhile, styled in a black, transparent look, like the roof, is the 60:40 split rear door that swings open to the sides. The interior: The front passenger seat was quite intentionally left out on this taxi. In its place, there is a cargo space for luggage; the instrument panel design was modified in this area, creating additional space. Since luggage does not need to be lifted high over a sill, it is easy for passengers to stow the luggage themselves and secure it with a holding bracket at the press of a button. The actual bootspace behind the rear bench is only intended for small articles of gear; this frees up as much space for rear passengers as possible. And space there is truly abundant: Knee room behind the driver's seat rivals that of full-size luxury saloons (120 millimetres). A passenger sitting on the right rear seat can even stretch out his or her legs fully thanks to the nonexistent front passenger seat. In the rear, the interior height is nearly unlimited too, thanks to a headroom dimension of 994 millimetres. 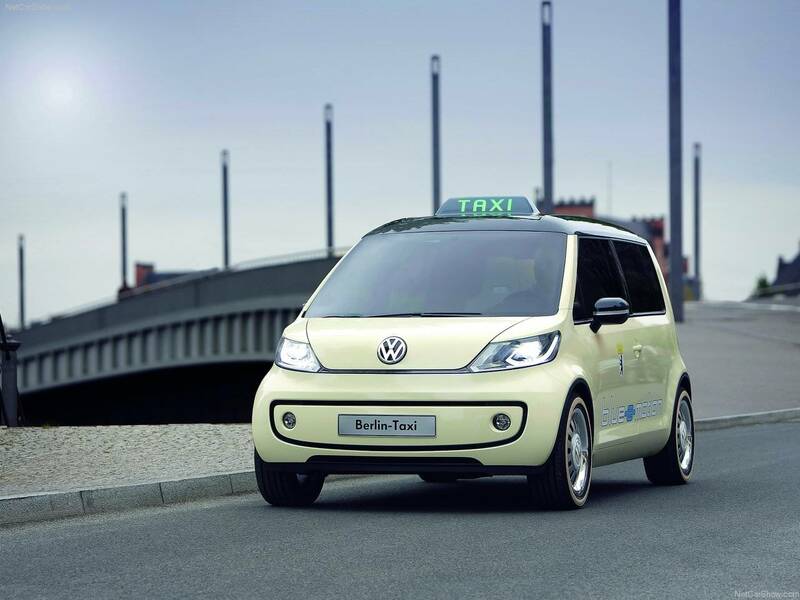 In the Volkswagen Berlin Taxi Concept, passengers no longer need to gaze at the taximeter in the front to see the fare. That is now a thing of the past, because of an 8-inch touchscreen in the rear next to the driver's seatback. It not only displays taxi charges; equipped with a card reader, it also offers the option of paying by credit card. During the drive, passengers can also call up information (in various languages) about "points of interest" (POIs) along the route, navigation data (overview of the entire route, remaining route and arrival time), weather data and the current date and time. In addition, passengers can adjust climate control settings for the rear from the touchscreen. Yet, a taxi is not just the most comfortable means of transportation for passengers; it is also the driver's workspace. 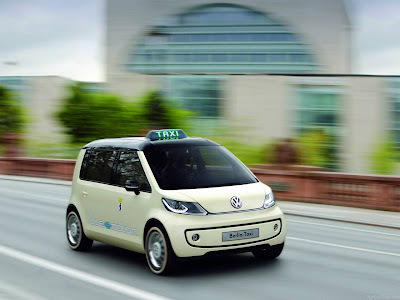 That is why Volkswagen placed high priority on an optimal design in this area of the Volkswagen Berlin Taxi as well. One result of development work: a new Taxi Interface, on which important indicators and controls are bundled on an 8-inch touchscreen near the centre console. This screen is intuitively operated and includes these functions: taximeter, door opener for the passenger area, trip computer, navigation system (destination input by keypad, handwriting or speech control), electric drive energy flow and power status indicator, climate control (for driver and rear seating area), taxi radio and telephone, clock time and online data showing a regional events calendar and weather data. The driver can call up the menu interfaces for basic functions in just seconds by shifting the application pages up or down on the touchscreen. In addition, taxi drivers can load their personal applications and customise the sequence of functions in the display. A clever feature: The instrument cluster in front of the driver (including speedometer, odometer and navigation instruments) is networked with the touchscreen on the centre console. Up to four functional modules may be "moved" to the instrument cluster by a simple stroke movement of the fingers, so that they can be visualised there in a smaller form. The taxi's ergonomics are designed for a long work day with a sport seat and an armrest integrated in the stationary seat border (separating the driver's area from the rear and luggage areas). Located in front of this are the multifunction switch for the engine (Start/Stop) and gearbox control (D, N, R). The VW Berlin Taxi Concept, with its top speed of 120 km/h is driven by an electric motor with a peak power of 85 kW (continuous power: 50 kW). The motor is supplied with energy via a lithium-ion battery integrated in the concept car's underbody. 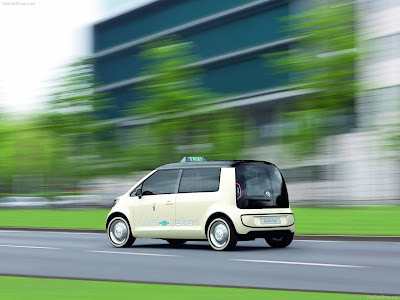 Thanks to the implemented battery storage capacity of 45 Kilowatt-hours (kWh) and the relatively low vehicle weight (1,500 kilograms), despite the battery, it is possible to cover distances of up to 300 kilometres (per NEDC) depending on driving style. The storage battery can readily be recharged to up to 80 percent of its total capacity in just over one hour; the actual time will depend on the available recharging infrastructure and battery's momentary charge state.